^ "FOI Request – Road numbering" (PDF). Department for Transport. 2005-08-05. Archived from the original (PDF) on 2009-05-12. Retrieved 2007-12-27. ^ a b c "Road Numbering". The Vauxhall Motorist. Vauxhall Motors. January 1935. Retrieved 2007-12-29. ^ Wykes, C. H. (1959-07-07). "How the Motorways were Numbered". Ministry of Transport Memorandum. Pathetic Motorways. Retrieved 2007-12-28. Professional drivers make great use of the system and I do not think that it is a matter of very great moment that some private motorists prefer to work on names alone. ^ a b c d Wykes, C. H. (1959-09-30). "How the Motorways were numbered". Ministry of Transport Memorandum. Pathetic Motorways. Retrieved 2007-12-28. 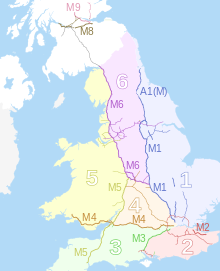 Where, however, a motorway is merely a by-pass along an existing route such as the Doncaster Bypass along Route A.1, it will not be given a separate M number, but in order to make it clear that it is a motorway and that motorway Regulations apply to it, the letter M will be added in brackets to the existing route-number – e.g. A1(M) for the Doncaster Bypass. This will preserve the continuity of the route-number of long-distance all-purpose roads. Generally speaking by-passes that are eventually linked to form a continuous motorway will preserve the existing route-number (plus M in brackets) until they are so linked. ^ "How the Motorways were numbered". Ministry of Transport memorandum. Pathetic Motorways. November 1961. Retrieved 2007-12-28. Mr Usborne explained that his proposal followed the principle of the sector system on which trunk and classified roads were already numbered, although the sectors themselves, which were six in number, were somewhat different. ^ a b Wykes, C. H. (1959-07-07). "How the Motorways were Numbered". Ministry of Transport Memorandum. Pathetic Motorways. Retrieved 2007-12-28. The result of applying such a system to current plans would be the appropriate numbering of the London – Yorkshire Motorway as M.1, with provision for extension still further north as required. M.2 would be reserved for any possible Channel Ports Motorway, the Medway Towns Bypass meanwhile becoming A.2(M) and the Maidstone Bypass A.20(M). M3 would be reserved for a motorway in the direction of Portsmouth – Southampton, starting with the Exeter Radial. M.4 would be applied to the South Wales Radial. The remaining single figure numbers would not be required for radials and could therefore, continuing clockwise, be applied to the Bristol – Birmingham Motorway – M.5 and the Penrith – Birmingham plus Dunchurch Bypass – M.6. The Preston Bypass was numbered M.6 in advance and although under these proposals it should initially have been A.6(M), I see no reason to make any change from M.6 pending the ultimate completion of the whole route. ^ Payne, B. A. (1959-07-10). "How the Motorways were Numbered". Ministry of Transport Memorandum. Pathetic Motorways. Retrieved 2007-12-28. 1. The numbers 7, 8 and 9 which were used in Scotland should be reserved for the use of Scottish Motorways. ^ Marshall, Chris. "What is a C-road?". CBRD. Retrieved 2007-12-29. ^ Marshall, Chris. "C-Roads". CBRD. Retrieved 2016-09-14.